The 45-year old three-putted five times in a third round 77 to blow his chances of a first tour win for seven years. But he confessed it was a thrill to rack up his third top-10 in four starts and head to Royal Portrush for the Irish Open with high hopes of doing something special. “Very much so,” said the 2014 Ryder Cup captaincy favourite, who eventually finished up just a shot outside a play-off for the title between Australia’s Marcus Fraser and England’s Danny Willett as wind and rain took their toll on the leaders. “Looks like it will be a top-10 again and that will be three top 10s in four tournaments. It’s a long time since I’ve done that,” he said. Willett eventually claimed his maiden title after a fourth visit to the 18th in sudden-death, chipping dead from behind the green before Fraser three-putted. 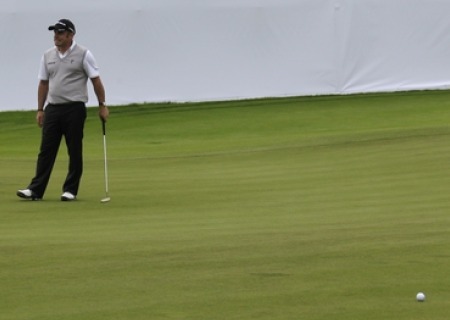 The Australian lipped out from 25 feet for birdie and missed a four-foot return putt. Ranked 322nd in the world, a vast improvement on a career low of 625th just over a year ago, McGinley is delighted with his resurgence in form. As for the Irish Open at Royal Portrush, a course where he reached two North of Ireland Amateur Open finals, McGinley said: “It is good to go there in good form and I am looking forward to it. McGinley was left to rue his third round 77 and his five three-putts were still on his mind when he posted a 66 to set the clubhouse target at 10 under par. “The big gaping thing in the week is what happened yesterday,” he said. 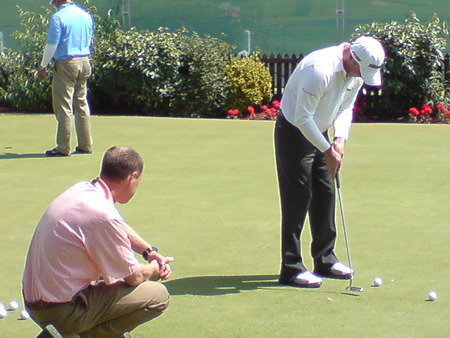 “Five three-putts. I don’t think I have ever had five three-putts in a round before. McGinley had 34 putts on Saturday but used the blade just 28 times on Sunday as he fired seven birdies and just one bogey. “Obviously I have got to give some thought as to what happened yesterday,” he said. “Why did I lose my speed? Why did I lose my confidence? I’ll give some thought to that over the next few days and get ready for next week. “It was a good reaction today. I had a good think about my putting last night. There was a bit of moisture in the greens today. They weren’t as dry as they were yesterday and when there is a bit of moisture on them they run a bit smoother. Damien McGrane triple bogeyed the ninth to go out in 40 but he had four birdies on the back nine as he came home in 32 for a 72 that left him tied 44th on one under. Simon Thornton had three birdies and four bogeys in a closing 73 to share 54th on two over.